I have reloaded PoE, and have been heavily playing for two months now. It appears that people are clearing maps much faster than me. Is it my builds / me / both? If me, is there a newbie playstyle I may be falling victim to? 1. Replace Goldrim with a rare helmet. Don't worry about the resists you lose from Golrim - you'll get those from your jewellery, belt, and gloves. Get the projectile speed enchant instead of the damage one and replace the projectile speed gem with cold penetration for a lot more damage. You can either get a pre-rolled helmet with 70+ life and some resists or you get a base with the enchant and craft it yourself. 2. Replace Bisco's Leash with a rare belt. A Stygian Vise would be ideal, but a leather belt or heavy belt is great as well. You want lots of life and resists on your belt, we are talking 90+ life and 70+ resists. 3. Replace Winds of Change with rare gloves. The projectile speed is nice, but low life and no resists are not worth it. Again, look for 60+ life and 50+ resists. Mana is a nice bonus if available. 4. Replace Deodre's Damning with a rare ring and upgrade your other ring too. 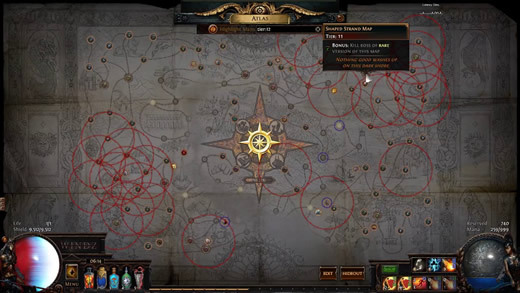 You are looking for 60+ life, 60+ mana, and 60+ total resists on each ring. Use these slots to fix your resists as well as stat requirements, as you likely need some dex for the green gems. If you include dex in your search you should lower the resist requirement to 30, else it gets too expensive. U4GM.com as one of the most professional online store which glad to share more PoE News and cheap poe currency buy with instant delivery.